We are happy to announce the expanded regional availability of DocumentDB. 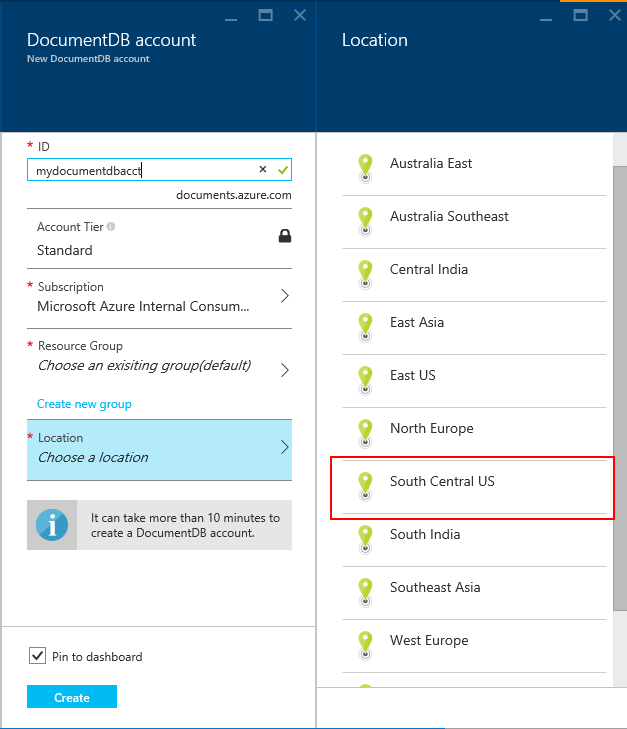 You can now provision DocumentDB accounts in the South Central US region. This brings the total region count up to 12, including: East US, West US, North Europe, West Europe, East Asia, Southeast Asia, East Australia, Southeast Australia, Central India, South India and West India. Please note, the Australia regions are only available for customers in Australia while the India regions are currently only available for EA and selective customers in India. We will continue to invest in regional expansion in order to give you the flexibility and choice you need when deciding where to locate your DocumentDB data. Please let us know which Azure regions you’d like to see DocumentDB be available next by submitting your suggestions on the Microsoft Azure DocumentDB feedback forum.